You’re a fighter, warrior and a person who will never let MS get the best of you. 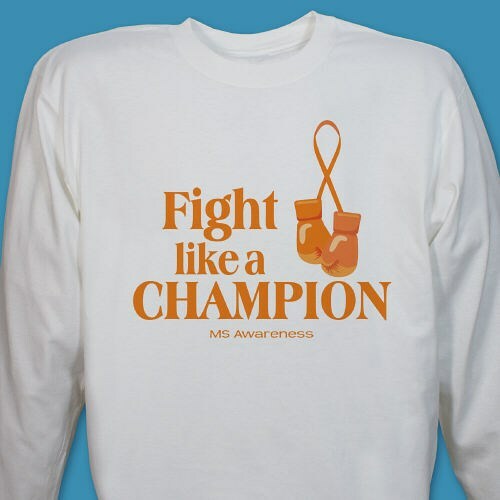 Show the world how strong you are by wearing this Fight MS Awareness Long Sleeve Shirt. Our Multiple Sclerosis shirts give encouragement to anyone facing the challenges of multiple sclerosis, help to promote awareness during MS walks or events & help support the MS community. Our MS Awareness Long Sleeve Shirt is available on our premium 100% cotton long sleeve shirt, machine washable in sizes youth S-L & adult S-2XL. Wear this MS Awareness Long Sleeve Shirt at your next awareness event!